We offer suggestions for arts lovers to discover (and re-discover) established and emerging artists, musicians and performers in and around Delaware. Although we particularly like to celebrate smaller arts organizations and individuals, we cover nearly anything that strikes us or that we feel you should know about. Periodically, we welcome guest bloggers and artists to join us. 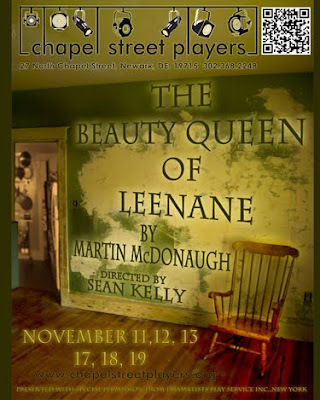 Beauty Queen of Leenane is a neat and tight play by Martin McDonaugh, a child of Irish parents born in London where his family had emigrated just as the families of his Leenane must do in the 1989 setting. The characters he presents are also quite finely drawn. Maureen, played with great energy by Kerry Kristine McElrone, is forty and feels as if life has passed her by. She is the youngest of three and the only maiden sister who, of course, got stuck with the harridan mother, Mag. Mary Catherine Kelley’s Mag was comic and tragic, following the intricate web that so many of us have in our relationships. She is sometimes funny and attractive and sometimes so aggravating that I was tempted to say, “Stop it” from the audience. The two actresses adroitly tossed off their alternating sweet and sours until it was hard to tell who was good, honest and true and who was a conniver. Enter neighbor Ray Dooley, the kind of guy who is always friendly but ever-so-slightly annoying, who comes over and you immediately wish him gone. Patrick Cataract gives him a certain innocence and gentle appeal and you wonder why he seemed to be a fly on the wall to our lonely but attractive Maureen. Maureen sets her sites on Ray’s older brother Pato, a warm and congenial guy played by David C. Hastings. Pato was not sure if Maureen’s pursuit of him was because she loves him or because she wanted to aggravate her mother. His letter to Maureen is a wonderful palette of his emotions and doubts and he delivered it in a monologue that deserved a standing ovation. (Unfortunately, our audience was terribly quiet on Friday, but it didn’t hurt the play’s quality). The drama unfolds with revelations from everyone – with each of the characters unfolding those details they had so carefully kept under their hats during the first half of the play. Credit to McDonaugh for such a great script and for the actors and director Sean Kelly for making sure they didn’t reveal too much too soon. The next performances are November 12, 17, 18 and 19 at 8 p.m. at the Chapel Street Players on Chapel Street in Newark. Michelle Kramer-Fitzgerald, creator & manager. Originally from Pittsburgh and a die-hard Penn Stater, Michelle is the Owner of Arts in Media, a Delaware-based arts promotion firm, which launched this blog in June 2009. She enjoys and tries to support every genre of Arts. In her (rare) spare time, she loves to read, cook and occasionally, paint. She lives in Wilmington with her husband, Scott, puppy Eli and previously, Dewey the Art Dog.